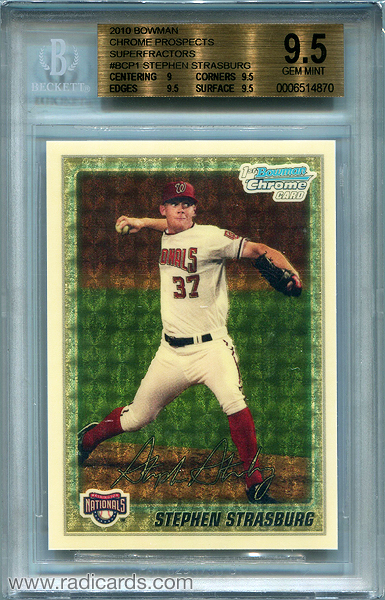 The Stephen Strasburg 2010 Bowman Chrome Prospects Superfractor is one of the all-time most historical rookie cards to come out of the entire hobby. This card has been covered extensively by minor sites, topical news sites, and major hobby media outlets. It has changed hands several times since it was first pulled in May of 2010. This card is one of the key reasons why I often reminisce about that fine summer and what a memorable time it was. I can't think of any other modern card that's been covered, or has traveled to the same, or even similar degree as the Stephen Strasburg 2010 Bowman Chrome Prospects Superfractor. This card has been an ambassador for the hobby. It has drawn new collectors to, and inactive collectors back to the hobby. What you're about to read is the comprehensive history of one of the most talked about baseball cards of all time. 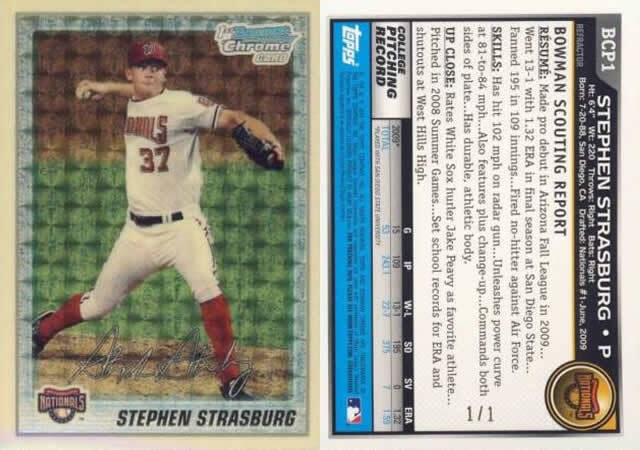 Stephen Strasburg is a right handed pitcher from San Diego State University. In 2008, he had a 23-strikeout game at SDSU. He became the first college player to be called to the U.S. Team since the decision was made to use minor leaguers in 2000. As a member of the USA National Team, he went 24-0 in a series of international contests on the east coast. In seven appearances with Team USA, he went 4-0 with an ERA of 0.88, and struck out 62 and walked seven over 41 innings.1)Player Profile. http://www.goaztecs.com During his Major League debut on June 8, 2010, he posted a 2.57 ERA and struck out 14 batters over 7 innings.2)Pittsburgh Pirates at Washington Nationals Box Score, June 8, 2010. www.baseball-reference.com These are just some of his many crowning achievements. Regardless of whether or not you follow baseball, this kind of performance is generally considered legendary. 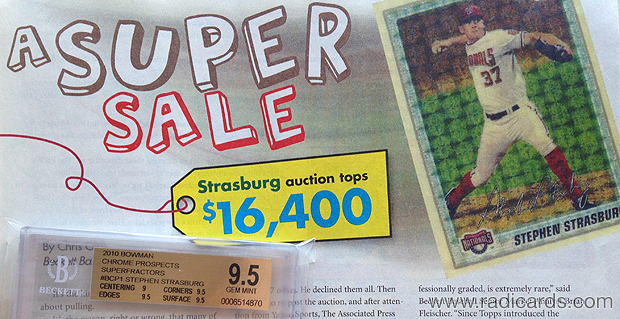 Strasburg's magnificent performance on the field translated to literal rich interest in the hobby. 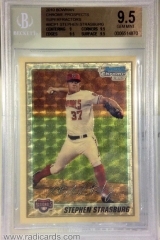 The 2010 Bowman Chrome Prospects Superfractor was pulled at the perfect time. This is the total number of packs made for 2010 Bowman Chrome Prospects Baseball. A single box of 2010 Bowman Chrome Prospects contains 18 packs, which means approximately 177,834 boxes were made. A single case of 2010 Bowman Chrome Prospects contains 12 boxes, which means approximately 14,820 cases were made. 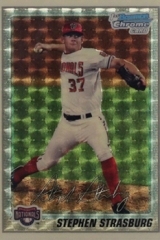 With national distribution, one might consider the pull of the Stephen Strasburg Superfractor to be the hit of a lifetime. The Summer of 2010 was a distinctly memorable one for me. I was living in Southern California at the time and dealing with unfortunate financial and relationship struggles. It wasn't all bad, however. 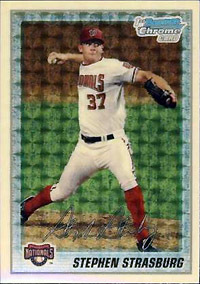 That summer I had the opportunity to work at a baseball card shop in North Orange County so I was exposed to the initial Strasburg hype first hand. 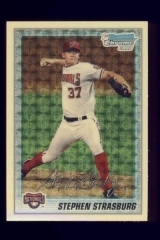 Packs of 2010 Bowman Chrome were hard to keep in stock and per pack prices rose from $3.99 to $11.99 in just a matter of weeks. Everyone was after Strasburg. It was an excellent time for the hobby. 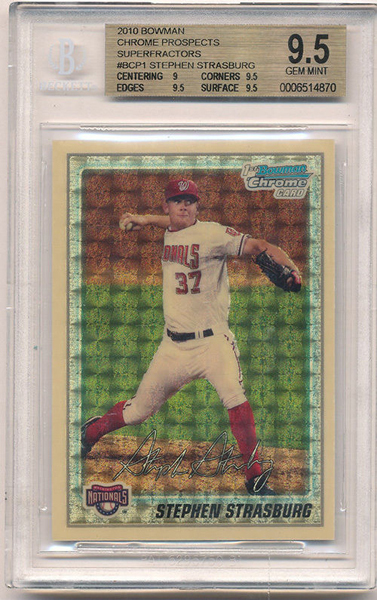 Then just before Strasburg made his MLB debut, the Superfractor surfaced and became the catalyst, the tipping point for maximum hobby exposure. 2. → May 2010: Robert Power Wins eBay Auction. At its close, Robert J. Power, an Accountant from Michigan, won it for $16,403.11)Strasburg card buyer is sold on pitcher. 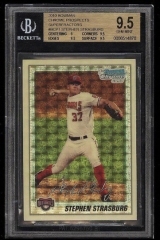 www.espn.com The auction caught the attention of Beckett Media's then Hobby Editor, Chris Olds, which landed the buyer an interview to discuss this card and his collecting background.12)Exclusive - Stephen Strasburg Superfractor Buyer: "A Card Like This Is Just What The Industry Needs." blogbeckett.wordpress.com Coverage of the sale was published in the September 2010 issue of Beckett Baseball. Power was also interviewed about the card on ESPN's First Take. Olds, C. (2010, September). A Super Sale: Strasburg auction tops $16,400. Beckett Baseball, 10.7(54), 5. 3. 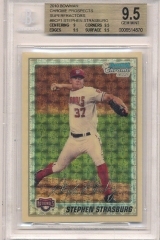 → June 2010: Robert Power Has Superfractor Graded and Sells It. Unfortunately, as a result of hobby publicity, Power received a number of negative messages from others in the hobby so he decided to sell it.13)Strasburg Superfractor Buyer: "Negativity Has Driven Me Out" blogbeckett.wordpress.com I can remember being kinda sad when I heard about this. 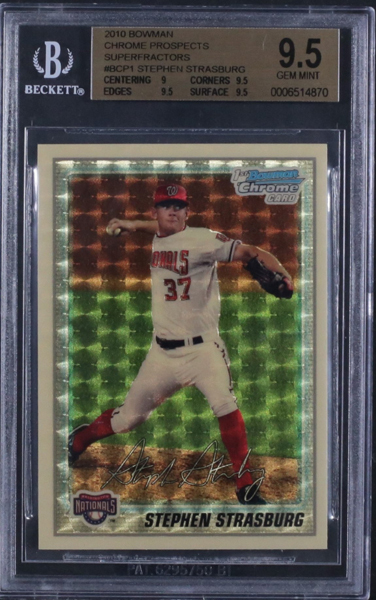 After Strasburg made his debut, Power sent the raw card to BGS,14)Beckett Grading Services which would come back a Gem Mint 9.5. 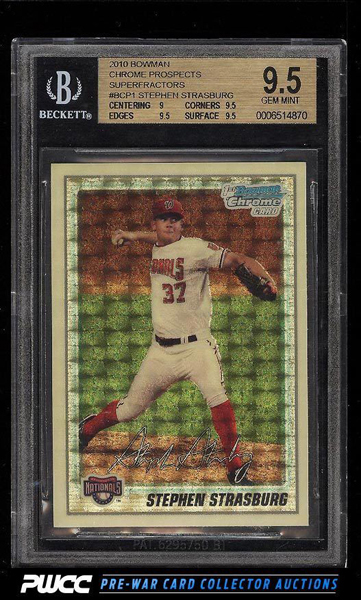 Given the high grade, some have questioned it as a publicity stunt by Beckett since it was graded during the prime of its hype.15)2010 Bowman Chrome Superfractor Stephen Strasburg Part II. 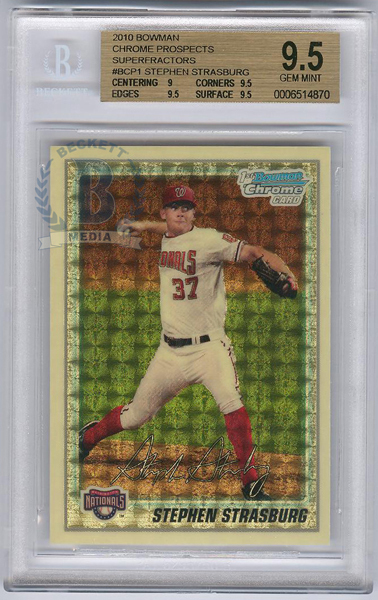 www.sportscardreport.info Further, some think BGS intentionally over-graded the card for financial gain.16)Beckett's generous Strasburg card grading fuels customer backlash. www.tuffstuff.com However, BGS stands by its grade.17)Arguing for and against the Strasburg BGS grade. www.acardboardproblem.com During that time, Power listed the card on eBay and it closed at $25,000.18)2010 Bowman Chrome Stephen Strasburg Superfractor BGS 9.5 Sold For $25K. 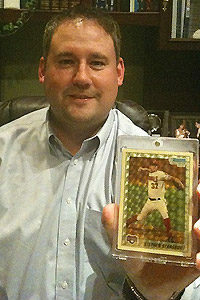 www.sportscardradio.com However, due to some illegitimate high bids, the card was sold to Brian Gray: Owner, Leaf Trading Cards (then, Razor Entertainment Group)19)Razor Entertainment en.wikipedia.org for $21,403. This still stands as a very large number for a card that's not autographed. June 28: The card is resold on eBay for $25k. 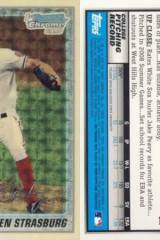 With bogus high bids, the card would be sold to Brian Gray of Leaf Trading Cards for $21,403. 4. → July 2010: Brian Gray Purchases Superfractor and Packs It Out. The card was purchased by Brian Gray: Owner, Leaf Trading Cards22)Exclusive: Second Sale of Strasburg Superfractor Takes Twist. blogbeckett.wordpress.com (Carrollton, TX), who packed it out in Leaf's 2010 Razor Rookie Retro buyback product. 5. → June 2011: Devin Grant Pulls Superfractor from Leaf Pack. 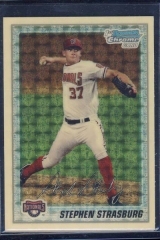 In 2011, the Superfractor was pulled by California resident, Devin Grant.23)California Man Finds Stephen Strasburg Superfractor in Pack, Plans Raffle to Benefit Charity and Leagues. 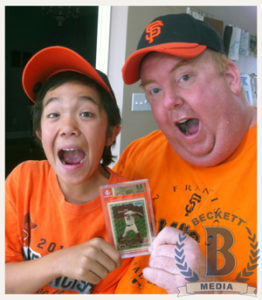 www.beckett.com/news Grant's original plan was to run a raffle to raise funds for a charity.24)Coastsider hopes to hit a home run for charity. www.hmbreview.com/news However, due to issues associated with running the raffle, Grant holds onto the card until 2015. Read on. 6. → July 2015: On Display at the National Sports Collectors Convention (July 29-August 2). I attend the 2015 National Sports Collectors Convention in Chicago, IL and see it on display at the Beckett Media booth. 8. → June 2017: Superfractor Listed on eBay. In June of 2017, the buyer from Carrollton, TX would then go on to list the card on eBay with a BIN of $9,995. It would go unsold. 9. → July 2017: On Display at the National Sports Collectors Convention (July 26-30). My buddy, Dan G., with whom I do videos, indicated he saw it on display again at the 2017 National Sports Collectors Convention in Chicago, IL. 10. → August 2017: Superfractor Acquired By and Sold Through PWCC Auctions. In August of 2017, the card made its way to PWCC Auctions (Lake Oswego, OR), which is how I acquired it.29)Auction History. www.pwccauctions.com Given the historical nature of the card, I had a feeling this was likely going to be my last chance at obtaining it. With calculated decision making and strategic financial planning, I placed an aggressive bid and won the auction. This card is well traveled. If you're like me, visuals help. Enjoy this animated visual travel timeline. The Stephen Strasburg 2010 Bowman Chrome Prospects Superfractor is, in many ways, The Iconic Bowman Chrome rookie card. Since its coverage, it's been referenced by other collectors when superfractors of other big time prospects surface. Questions and considerations such as, "Will it reach Strasburg heights?" are common among those conversing around speculations related to final values of key superfractors. In April of 2015, Chris Olds interviews Brian Rideout of Neuhart Cards to discuss a card pulled by one of its customers - the Kris Bryant 2013 Bowman Chrome Draft Draft Pick Autographs Superfractor. In the following video at 2:05 and again at 6:42, the Strasburg Superfractor is referenced.30)Kris Bryant Superfractor hits BGS. www.youtube.com This just shows that even years later, the Strasburg Superfractor is still covered in hobby discussions around big hype and even bigger sales. Granted, values for cards in the same category have since well surpassed Strasburg numbers but to my knowledge all of these cards feature autographs. 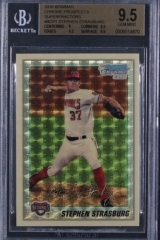 The Strasburg Superfractor is an anomaly because it doesn't have an autograph and yet drew significantly more attention than the parallel that does i.e., the Red Border Autograph 1/1, which was sold through Huggins & Scott Auctions33)Lot Details. 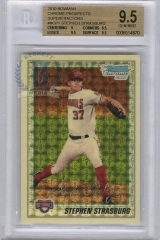 hugginsandscott.com for more than the inaugural sale of the Superfractor.34)2010 Bowman Stephen Strasburg Red Auto Sells For $19,975. www.cardboardconnection.com/news Between the two cards, I personally think the Superfractor is the more attractive and desireable card and as we've seen from coverage and recorded sales, that appears to be the majority consensus. 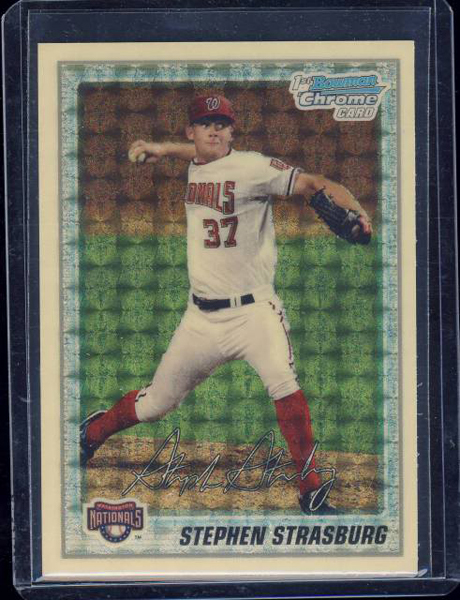 I've collected every different image of the Stephen Strasburg 2010 Bowman Chrome Prospects Superfractor I could find from across the web. The gallery includes one pic I took and one scan I created. These images are loosely organized by the date they were created. With all the chatter and coverage over the years, I came to appreciate this card more and more. The hobby thrives off passionate buyers and sellers. 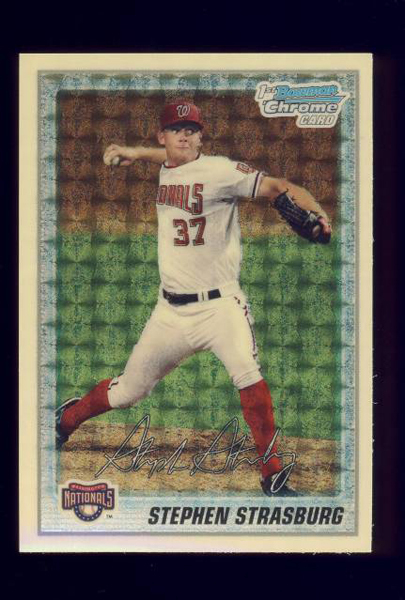 The conversations, the excitement, the trades, the buys, and the relationships are all made better by cards like the Stephen Strasburg 2010 Bowman Chrome Prospects Superfractor. It's an important card with an immense history rich with conversation, the kind that keeps me coming back to think about it time and again. It's this kind of thinking that helps drive continuous passion for the hobby I love so much. So here I am, holding the legendary Stephen Strasburg 2010 Bowman Chrome Prospects Superfractor in celebration of its induction into The Radicards Collection, the final residence. Have something to say? Please leave a comment. Blowout Cards Announces a Bounty of $75k for Shohei Ohtani Superfractor but are the Terms too Ambitious? This blog post is mentioned between 33:47 and 36:52.